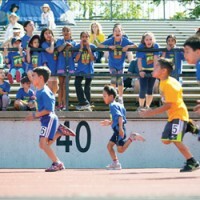 The fourth biennial Bullis Charter School Invitational Junior Olympics drew a crowd of nearly 1,000 student-athletes and spectators June 1 at Foothill College. The event is the only athletic competition of its kind in the area for students who attend charter schools. In addition to Bullis Charter School, participating schools included Charter School of Morgan Hill, Livermore Valley Charter School, Voices College-Bound Language Academy, Rocketship Discovery Prep and Rocketship Mateo Sheedy Elementary School. Darcie Green, member of the Santa Clara County Office of Education Board, kicked off the event by welcoming the crowd during the opening ceremony, which featured a performance of the “The Star-Spangled Banner,” the entrance of all student-athletes onto the track and a choreographed rhythmic gymnastics routine starring students from first through eighth grades. Students carried a ceremonial Olympic torch, which traveled to all of the competing schools in the weeks leading up to the event. The daylong competition included traditional track and field events plus an egg and spoon race, a beanbag toss, a soccer-kick battle and a basketball shootout. Four local Olympians handed out medals to the event winners – including gold medalist Keshia Baker, who won the 4×400-meter relay at the 2012 Summer Games in London.